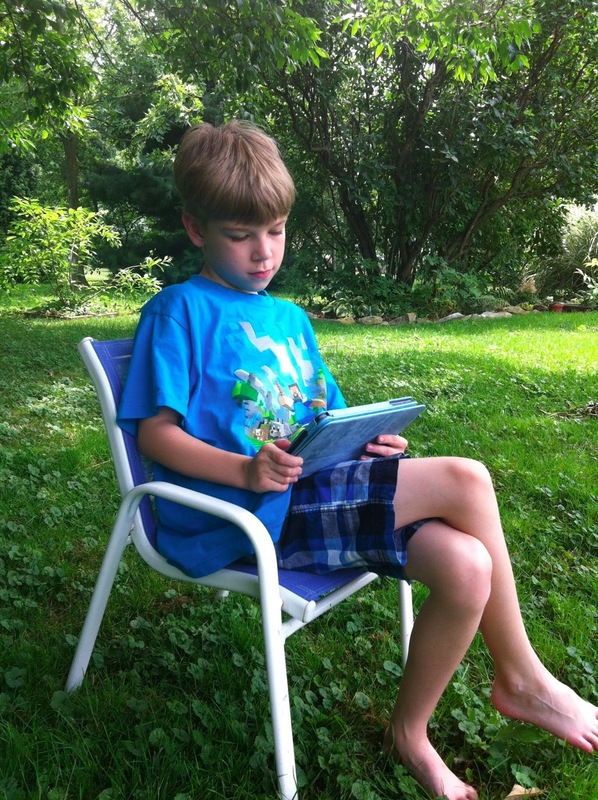 iPads in the Classroom: Planning for Next Year! This summer, "leaving my kids to their own devices" has taken on an entirely new meaning for my own children. They are very happy to be left to their devices--that is, their tablets! Summer reading is now just as much about finding new and interesting apps and e-books as it is about lugging home a huge bag of books from the library. I love to watch my own kids try things out and experiment with new technology and new books so that I can plan for the upcoming school year. Watching him interact with the device has helped me to do some thinking about what I want for my classroom next year. It's fascinating to watch him take the learning to different places--spread out on the couch, in the yard, in the car--and do activities at all times of day. Right now I only have one iPad. But my students still loved using it during independent reading. For my struggling readers, the questions at the end of the texts in Activity Spot helped them to see how they had understood the texts. Instead of being frustrating or boring, the questions were somehow motivating. The kids proudly brought me their scores or showed me how they had improved from before. Filling in the background knowledge gaps can be a daunting task for teachers. But the right content can help students to learn new concepts quickly. The iPad is the perfect tool to help students learn about scientific or historical concepts. A quick YouTube playlist can help students to learn about topics of interest. (For example, many of my students had never heard of tide pools. While it's not a topic that we cover, several kids were interested, so I made up a playlist to use next year.) Down times like bus time and indoor recess can become great learning opportunities. How are you planning to use iPads or tablets in your classroom next year? -Spelling is now on Google Drive! Email me at elkissn@yahoo.com with your Gmail address and I'll add you to the list to view the folder. You can read more about the spelling program we made here. If you have used the Master Word List, please comment or write to let me know! -Several people have written have written to ask about the Reading Intervention that I made last summer. It is available in four parts: Part 1, Part 2, Part 3, Part 4. 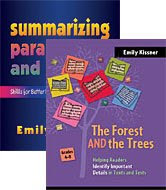 It includes texts, PowerPoints, and activities to build academic vocabulary and text structure awareness. -If you're looking for an easy introduction to text structure, you might like Introduction to Text Structure. It includes texts on the chinstrap penguin and the peregrine falcon, showing how text structures can be used to communicate different information about the same topics. -I'd love to hear what you think about Activity Spot! We had a great morning talking about grammar and the Common Core! Looking for the language standards by strand and then lining them up in grade level order helped everyone to really read the standards carefully and think about how they progress through the grade levels. Computer games can be another way to help students review and practice key grammar topics. However, there are so many games out there that sometime it is hard to find the ones that are really useful for elementary students. Here are some games that I have found (and tested) that work well for various concepts. Learn about basic punctuation with Comma Chameleon. In Alien Punctuation from BBC, students help aliens by correcting sentences to add correct capitalization and punctuation. The game Complex Sentence Camp helps students to learn how to punctuate complex sentences. Along the Sentence Trail, students decide on the kind of sentence and add correct end punctuation. This simple Noun Explorer game helps students to learn about nouns. The Adjective Adventure game helps students to identify adjectives. With the game Verbs in Space, students look for verbs. Multiple tenses are used. When we worked with sentence combining, I mentioned that Bruce Saddler had a book that includes more detail about sentence combining. The title is Teacher's Guide to Effective Sentence Writing. If you get it, drop a line and let me know what you think! Additional resources about sentence composing can be found at the Sentence Composing page hosted by Don and Jenny Killgallon. It's interesting to see how verb tenses are expressed through the Common Core. Beginning in second grade, students are expected to use verbs to show a sense of time. In third grade, they need to form and use the simple verb tenses. Fourth grade adds the progressive verb tenses, while fifth graders are expected to use verb tenses to show a variety of sequences and conditions. Like I said yesterday, the end of the school year has allowed me to return to the life of a fairly normal person. But traces of the chaos of May remain--the piles of laundry, the unanswered emails, the children left to their own devices. Ah, the children left to their own devices. This school year I haven't intervened much in my younger son's reading life. His reading assignment every night was blissfully easy--read anything you like for 20 minutes--but after Christmas he went to reading on the Kindle. It wasn't until Saturday at the library that I noticed that he had somehow transformed into what I call an "acquisitional reader". I've noticed these kinds of readers in every grade that I have taught--fourth, sixth, and seventh. Acquisitional readers all share a love for a particular series or genre. For some kids it is a series of books (The Warrior series for my young one), while for others it is a kind of book, like books about wolves or airplanes. Acquisitional readers are often very impressive in their knowledge about the series or books. Aidan knows everything about the Warriors books, the result of Internet searches and browsing online. Acquisitional readers can talk very knowledgeably about their favorite books. And this is the heart of the problem. -seeking new information about books. Put all of this together--minus the invisible brain work of engaging with books--and you have the acquisitional reader. In the library on Saturday, I realized that my youngest son is an acquisitional reader. He loves the Warriors series and knows a great deal about it. He has started many of the books. He knows all about the authors and why they chose the name Erin Hunter. But he hasn't really finished any of the books at all. The good thing about acquisitional readers is that they already love books. They already love reading. They just need to be nudged into that deep invisible brain work. From my experience, it sometimes takes a clean break away from the series or kind of book that they like so much. They already have such a rich knowledge of that series that they don't even realize that they are missing anything. For Aidan, choosing another book proved a challenge. He and I have been reading the Tollins books together over the last few months, so I knew that he loves word play and wry humor. I brought a few books to our library table for him to try. Toys Come Home proved to be the winner. (Yay! I love these books.) Although I had read aloud Toys Go Out to him three years ago, he didn't remember it, which meant that he was experiencing StingRay and the Girl for the first time. We're reading chapters together and then talking about them in detail, which I hope will help him to get to that feeling of being "way down deep" in a book. Most importantly, I want him to realize the dual pleasures of reading and enjoying what's on the page he's on right now and putting that together with the bigger story of the book as a whole. In some ways, acquisitional readers are not doing that badly. They do find pleasure in reading, even if they don't finish books, and they are able to have lively and animated conversations about books. Many adults wouldn't even notice that they aren't finishing. But they are missing out on the best part of reading. This is why for Aidan, and for my students, acquisitional reading must always be a stopping point, never the end destination. -At the end of the school year, what did you notice had been neglected for the last few weeks? -Have you noticed any acquisitional readers? What advice do you have for helping them? For me, the 2012-2013 school year has come to a close. Now it's time to settle back into the routines and do what I've pushed aside during that frantic month of May--read some books, conquer Mt. Laundrymore, and do some writing. In that month of May, my students and I focused on persuasive writing. What fun! We diagrammed examples of persuasive pieces, looked at how to craft strong persuasion, and wrote persuasive essays. How did it go? We finished our essays three days before the end of the year. Whew! It was cutting things a little closer than I like, but we took a leisurely pace in the last two weeks and everything came out okay. The rest of the persuasive writing materials can be found here. Enjoy these weeks of June!